When I look at ADVENTURE I think in terms of greatness. The Hoffman years of 1918-1926 were great; the Howard Bloomfield years in the 1930's were also great on a lower *greatness* scale; then the Ken White years in the 1940's were great but of a lesser greatness. By 1950 the great years were over and the pulps were starting to die off. 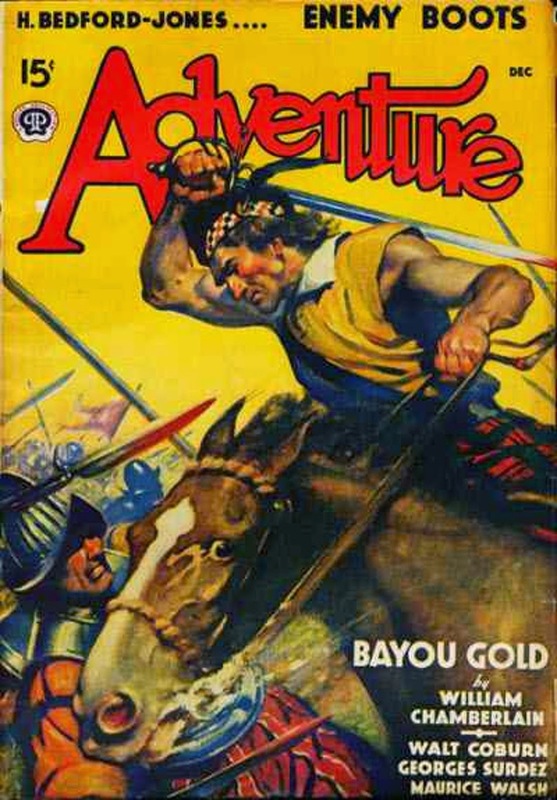 Even ADVENTURE was in trouble and in 1953 they tried a format change. The magazine was not a pulp any longer and was in the large 8 1/2 by 11 inch size. Sort of a companion to ARGOSY which at the time was a quality men's magazine. But this experiment was a failure and ADVENTURE became another run of the mill, sort of risqué showing bare breasted girls, magazine. This continued through the 1960's until the final format change of being a digest fiction magazine around 1970. This didn't work out and after a few digest issues the magazine was laid to rest. But for 753 pulp sized issue in 1910-1953, the magazine was one of the greatest fiction magazines ever published.